How to resize Server 2008 partition without data loss? Due to more and more applications installed to the system partition, when the system C: drive running out of space, the Server computer will be fighting for the precious space and will run much slowly. System maybe crash if there is no free space. What will you do in this situation? To start over is a solution but longer Server downtime means less customers and no one would like to waste their happy weekend to rebuild the Server. The most time-saving and easy way is to resize Server 2008 partition with reliable Partition Magic Server software. That is to say, shrink other data partition and get some free space and then extend the boot C drive with the Unallocated space, so there is no need to start over again to save time. There is no doubt that the fastest way to solve Server 2008 low disk space problem is by resizing and extending the boot partition, but you should choose the reliable partition software, no one would like to see boot failure or data loss after resizing. Based on the unique enhanced data protection technology and Copy Wizard built in Partition Magic Server, you don't need to worry about the data safety. This Server partition manager is highly recommended by many professionals and editors, besides, many Fortune 500 companies select it to manage their Servers. – It is extremely easy to resize Server 2008 partition. You just need to drag and move on the disk map to shrink an existing data partition to get some Unallocated space, and then you can extend the system partition, no need to delete, format partitions or rebuild the Server. – If the system partition is NTFS, you can extend it without rebooting. Click "Apply" to proceed, done. After several minutes, you'll have a "new" Server that can be used for a long time again. All-in-one Partition Solution – All your partition and disk maintenance requirements can be fulfilled. 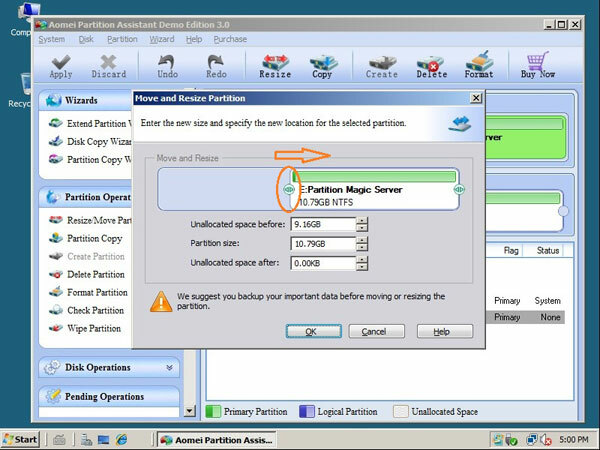 Download this server magic free trial and check how easy it is to resize Server 2008 partition.